An interesting day. 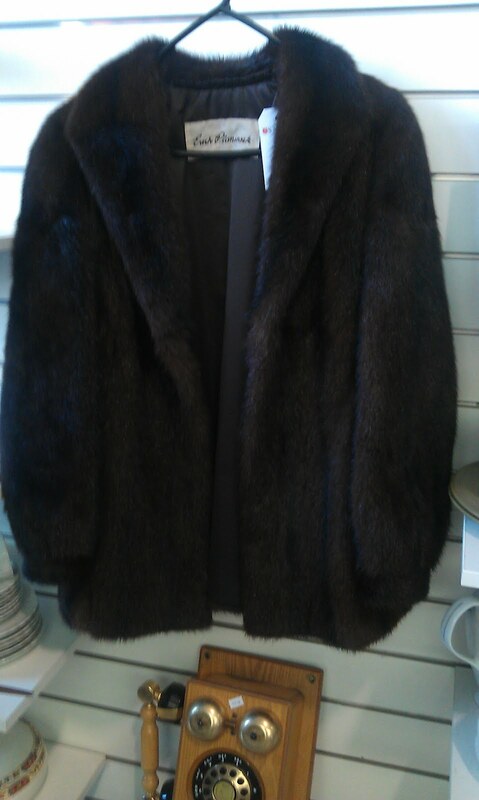 Browsing op shops in a Melbourne Peninsula suburb with Mother & Jnr RF, in pursuit of nothing in particular, Salvos presented us with a vintage fur coat. You may remember this blog post and discussion on vintage fur? Aforementioned fur coat, $350, label Erich Planinsek, three hundred and fifty dollars? Who is this Erich, and why is his second hand fur so expensive? However, I search second hand Erich Planinsek on eBay - I find nothing. I search second hand Erich Planinsek on etsy - I find nothing. Now whilst I have no concern with Salvos or any other opportunity shop charging whatever they feel a donated garment is worth, I do suspect $350 may be a little unrealistic. 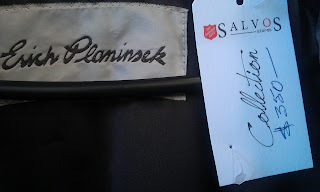 If you found a second hand coat by Erich Planinsek in an op shop for $350, would you buy it?! If you find an expensive unknown label during a second hand shopping expedition, would you research its brand name, and buy it if you think it is worth the money? How do you feel about charitable shops charging high prices for 'designer' labels? I am tapping my foot - the ad is great but not fur for me thanks new or vintage. Ah… a great topic for discussion! The only things in op shops I would spend $350 on is furniture and even then… it would have to be one of those " I have to have it" moments. When I'm thrifting and come across unfamiliar labels on interesting pieces, I will always do a quick search on my phone. If I feel it's worth the money, I'll buy it. I have mixed feelings about charity shops charging more for designer items. I understand why but sometimes feel attaching higher prices to things isn't really in the spirit of being a charity shop. However, like I said above… if it's worth the price I will usually um an ah and probably pay it. As a charity shop, their rationale is two-fold- to provide low-cost items to those who cannot afford to purchase full-cost items (not to mention people who love a bargain), and to generate revenue for their organisation. A designer item such as a vintage fur would generate a lot of money if sold at a premium price, but attract a bit of disquiet from regular shoppers, who see it simply as a blatant cash grab. I'd be interested to see if it does sell at that price! As for buying designer labels from opshops...if it suits me, , fits me and I like it (and if I have the money on me)I'd probably buy it. Very interesting topic Erica. I know I have felt like I've been smacked in the face sometimes when I have picked up a child's used garment to find that there is a hefty tag with specific labels. I can't help but feel it is a money grab, but knowing the money goes to charity does soften that blow. Still it wont be me buying at that price, I'll leave that to someone who appreciates the label more than me! 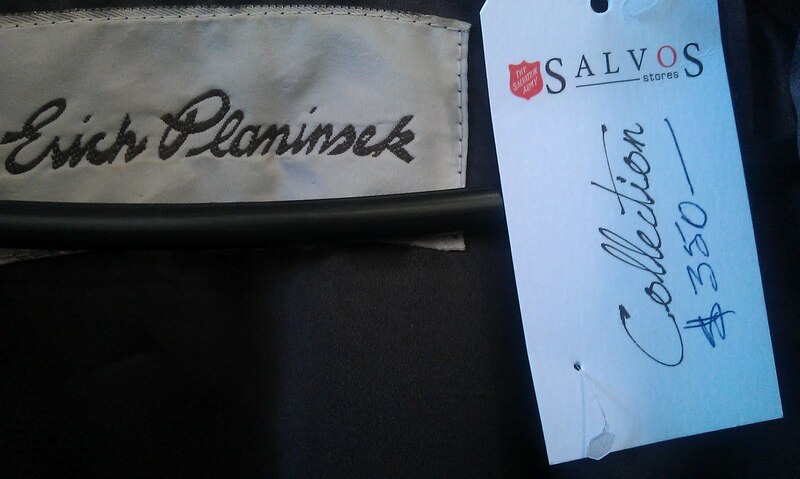 For some reason it doesn't sit right with me that the Salvos is selling for such a steep price in their own shop. I'm sure they have antique/collectable businesses and the likes that they sell special items to at higher prices so this should go in that category but not on their shop floor. I've noticed a trend in many big charity op shops (like Salvos and Lifeline) sticking higher prices on anything they think is "designer." I'd be fine with it if the garments were actually something special and worth the price tag, but heaps of stuff is really just "brand name" and not current season/vintage and in some cases it's not even good quality. I remember shopping in one op shop and seeing items from the retail chain store I was working in at the time priced well over the end of season reductions we had sold them for brand new. I understand that whoever does the pricing is probably a volunteer and not necessarily aware that a recognisable name on the tag doesn't automatically mean it's worth more money, but when the same stock is still there weeks (or even months) later you'd think that might be a clue that maybe the price just isn't right. Certain people are willing to pay certain prices. 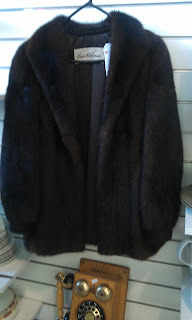 I would not pay $350 for a fur coat, but I have paid $300 for a D&G trench coat at a charity store in London. My stance is that an op-shop will try their maximum price first, and if it doesn't sell they'll drop it. It's like the engagement ring we saw at the auction – yeah great, it's valued at $1,500, but that figure just scared everyone off. You pay what you think something is worth. No more, no less. 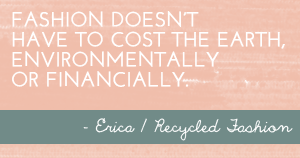 If it's too expensive, leave it. Ouch! Too expensive and not a recognisable label. Leave it! no go. the one thing i take great pleasure in when shopping second hand, is the super cheap price tag....to me, that's what makes second hand shopping fun--the deal. I don't spend that much money on new clothing items, so I'd have to pass on this one. The most I've ever paid for something was $200 for a pair of Dr Martens, and I'm not a big fur wearer anyway. Also, usually I only go op-shopping with about $50 in my pocket, so I probably wouldn't have the money on me anyway! I dont like the high value they put on target, forever 21, and hm. I can get those prices in the actual store. I think that its great to do researching of Designer Labels in opportunity shops. 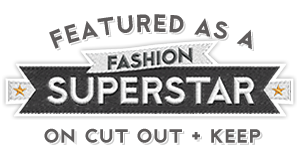 It would be a great chance for you to find the best designers label at a more affordable price. I know that it would make your dream to own expensive brands on your own. As a thrift shop manager, there is no way I would price an item - fur or not - at $350. Not only are you reducing the market of buyer, it is very unrealistic. My customers like to get a bargain and will only buy if the price and fit are right on the day. IF this item was worth $350 I would hold it back and auction it at our charity auction. That way it sells for whatever the crowd are willing to pay and - as it was donated and cost us nothing in the fiorst place- we are profitting no matter what. I have had an Armani suit RRP $3500 - and will auction it. I will be happy to get $45 for it and the buyer will be thrilled! Lets remember that the funds are helping those in crisi and need, but lets also be realistic and make our customers happy and keep coming back.